I went to the practice fields around 10am, but there wasn’t too much going on. 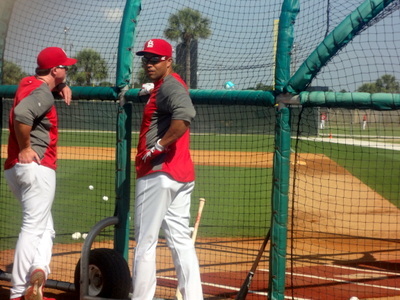 I watched Furcal, Beltran, and John Jay take batting practice under the watchful eye of Mark McGwire. 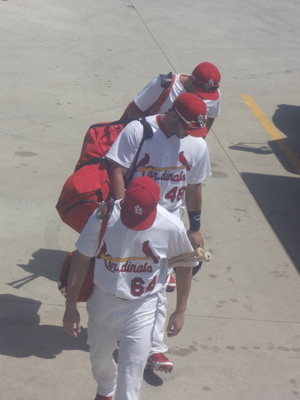 Afterwards, Furcal and Beltran signed autographs, but Jay had to get read to play that day. Beltran signed for about 30 minutes! He even signed a guy’s wooden leg. I got my cap signed. I had a great seat about 10 rows back from homeplate for the game. The Cards were taking on the Mets. 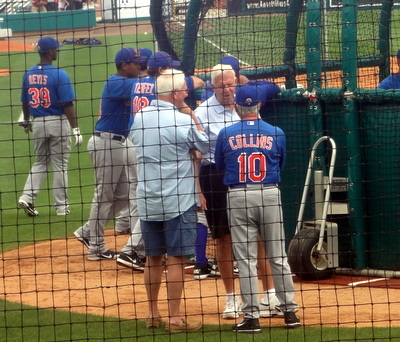 Before the game, I noticed Bill Parcells on the field, talking with the Mets coach Terry Collins. I was sitting by some friendly Marlins fans and even a friendly Yankee fan (imagine that! ), and it was a nice, convivial atmosphere. 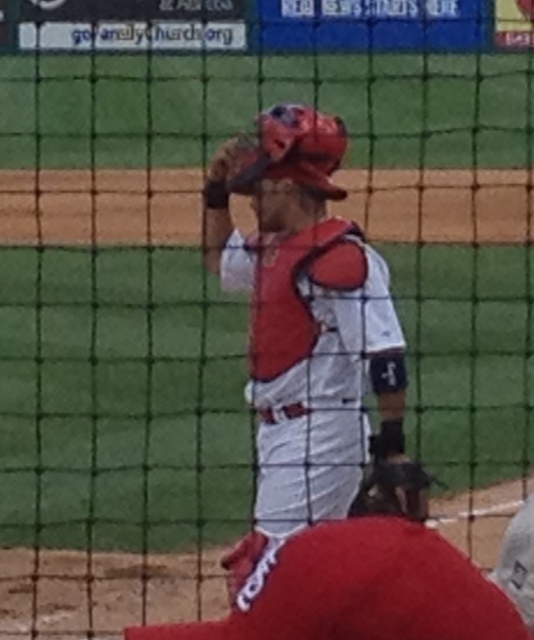 The Cards won 4-3, powered by great pitching by Kyle Lohse who also got an RBI. Lohse struck out seven batters in six innings. Matt Carpenter was our offensive hero with a double and a homer. 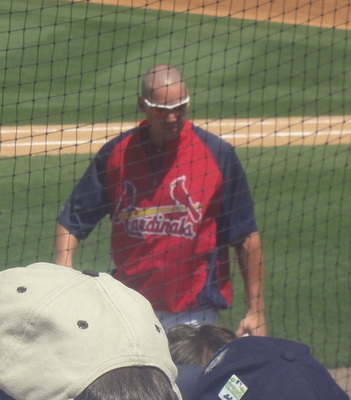 Chris Carpenter sat on the bench near the warm-up circle most of the game and signed autographs during inning breaks. I was able to get his autograph as well as Skip Schumaker’s autograph on my cap. After the game, I hung around the players’ parking lot for a bit with the hard-core autograph seekers. We watched players leave but only a couple stopped to sign. John Jay signed for a while, and so did Jaime Garcia. 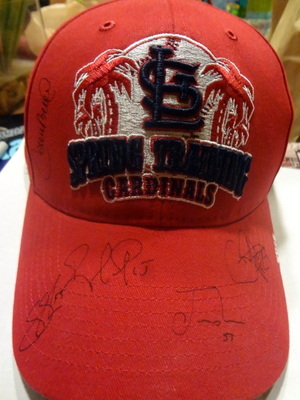 I ended up with 5 autographs on my cap – Garcia, Beltran, Furcal, Schumaker, and Carpenter – pretty cool souvenir. That night, I had a great dinner at Leftovers Cafe, which is owned by the same people who run Little Moir’s Food Shack where I’d eaten two nights prior. The ambience and food were pretty much the same. 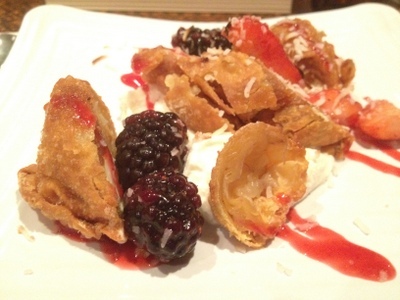 I had plantain-crusted fish and peanut butter banana empanadas. I sat at the counter and watched them cooking, so I really didn’t mind being a solo diner. 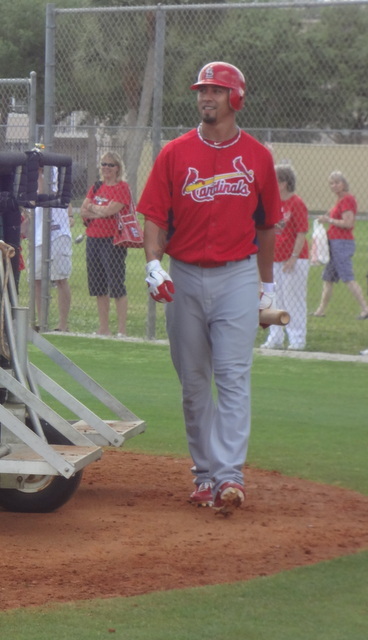 I had a great time at Spring Training. Wish I could go every year! I didn’t get up as early as I hoped (I’m on vacation after all), but I still got over to the Cardinals practice field around 11am. The starters had already finished their warm ups by then, but I caught some amusing batting practice by Wainwright, Lohse and Westbrook. 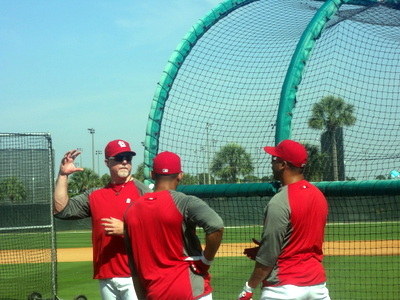 The coach throwing BP was a total comedian, making fun of their swings and encouraging competition. When they finished, all three players signed autographs for quite a while. I didn’t get anything signed, but I was able to get some good photos. I then watching some more batting practice. 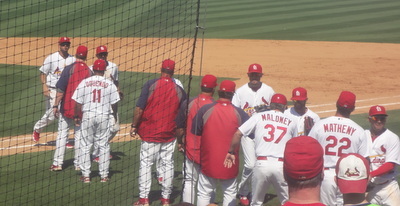 Mark McGwire and John Mabry were giving tips to Komatsu, Velez, (David) Carpenter, and others. They were quiet, so I couldn’t hear much, but it was fun to watch. My seat today was in section 118, between third base and home. 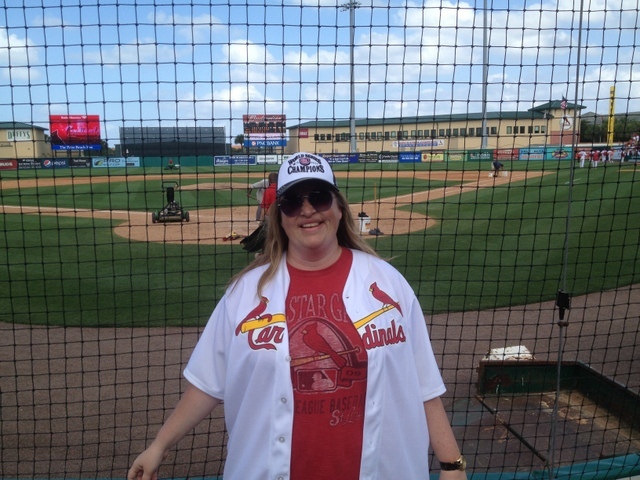 The Cardinals took on their fellow residents of Roger Dean Stadium – the Marlins. Hanley Ramirez has orange hair to show his Marlin pride. 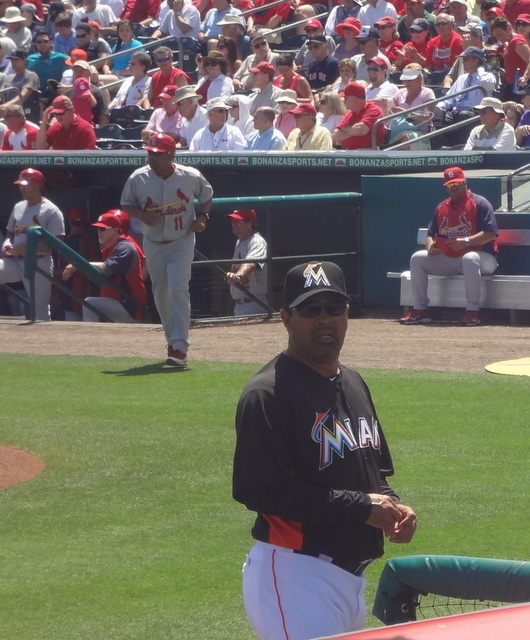 Marlins manager Ozzie Guillen and Carlos Zambrano kept the crowd amused. 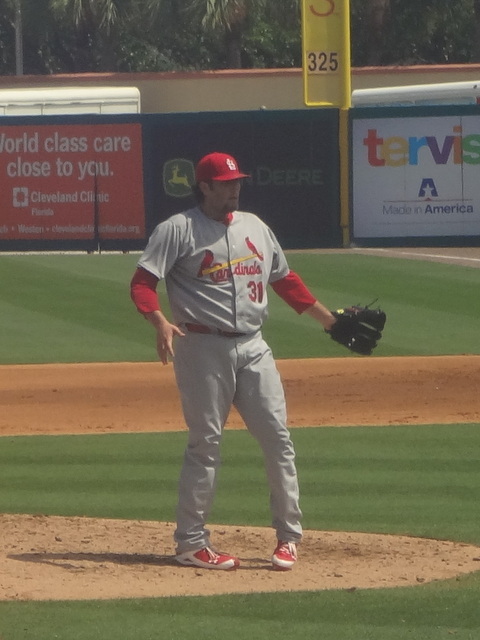 Lance Lynn had the start for the Cardinals today, and he did pretty well, but he gave up a home run to pinch hitter Daniel Pertusati. 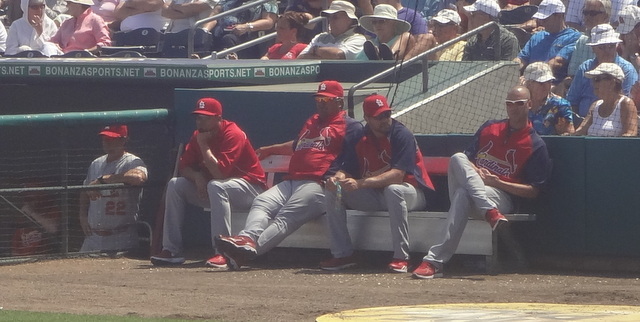 It was nice to see Chris Carpenter at the game, sitting at the end of the bench here – although it would be nicer to see him in the game. We got the home run back with a towering shot by Beltran. 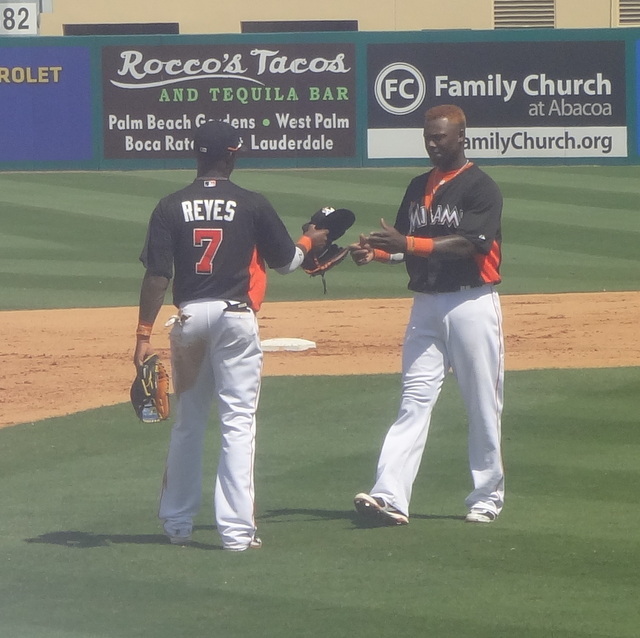 But then a throwing error led to another Marlins run, and they ended up winning the game 3-1. 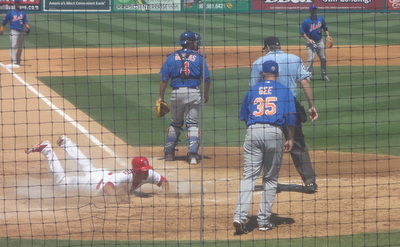 We wasted a good scoring opportunity with 2 men on and David Freese at the plate with a botched double steal. Yesterday’s game was more exciting, but it was still a nice day at the ballpark. 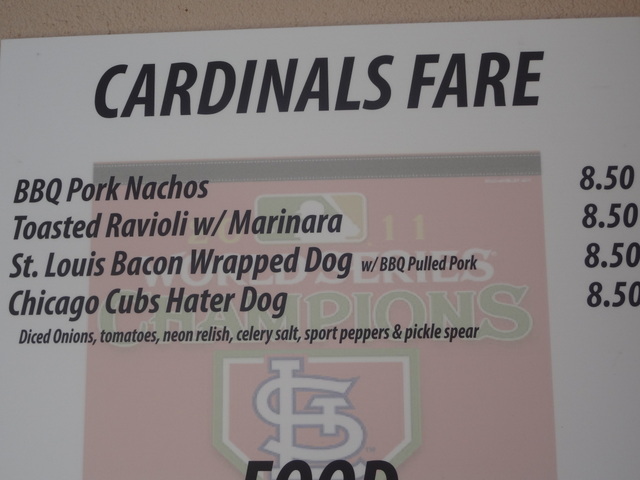 I had a cheesesteak and an italian ice today, although the Cubs Hater hot dog sounded intriguing. Maybe tomorrow. 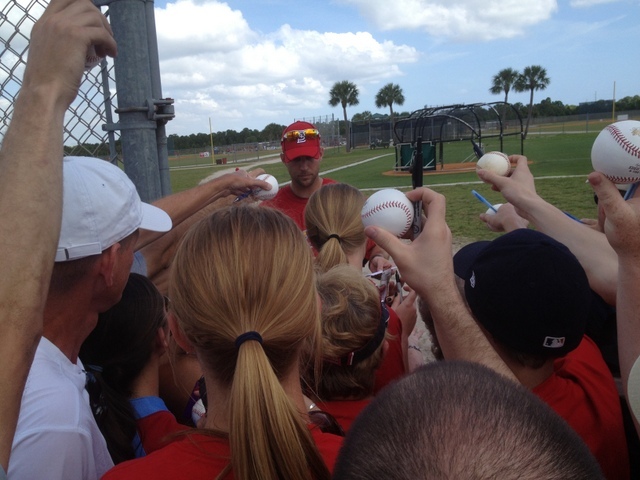 Cardinal Girl is back, and she’s excited to be reporting on Cardinals Spring Training, live from Jupiter! My vacation had a rocky start yesterday. My flight was delayed 2 hours, so I didn’t arrive into Ft Lauderdale until 1:30am today! Thankfully, I had booked a hotel by the airport for the night, but I still had a bit of a late start today for the 60 mile drive to Jupiter. 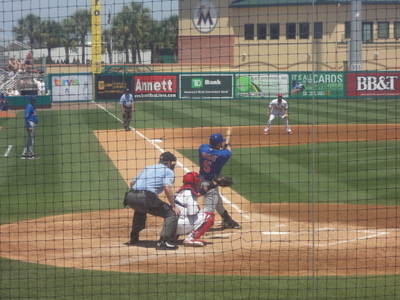 I got to Roger Dean Stadium around noon, got a hot dog and found my seat – 9th row behind home plate! 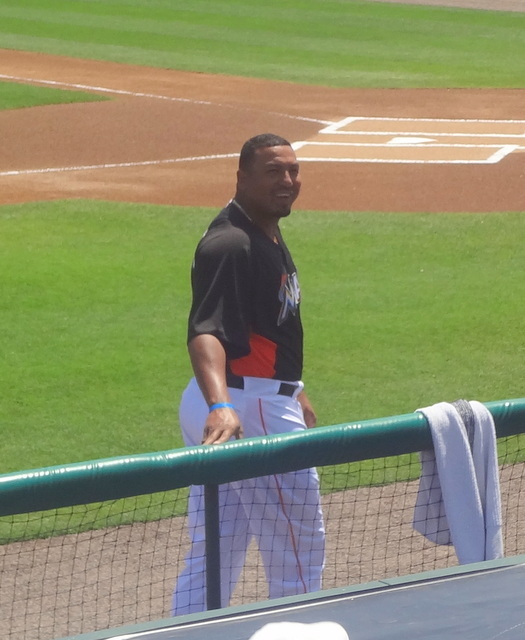 This is one thing I really love about Spring Training, being able to get so close to the action. That seat was $30 – not bad at all. 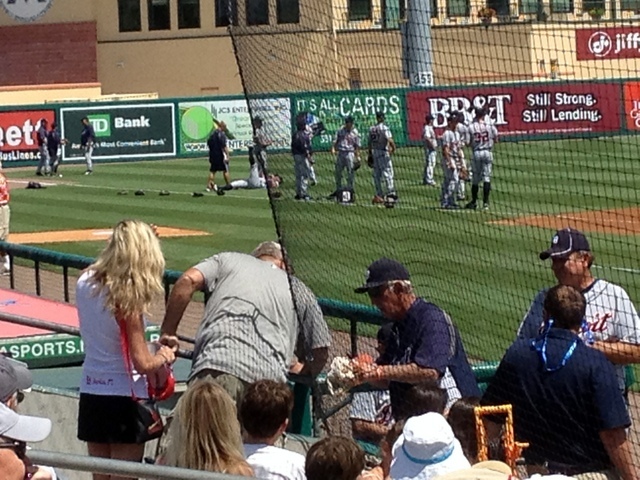 The Cards played the Tigers today, and Jim Leland signed some autographs before the game started. I bet he’s missing his old friend Tony LaRussa. Well…so am I. It definitely felt strange to be watching this team without LaRussa and Pujols. I saw a kid in a Cardinals Pujols jersey and considered calling child protective services – his parents really need to stop neglecting the kid and buy him a new jersey! But as today’s high scoring game proved, we do have numerous other weapons. 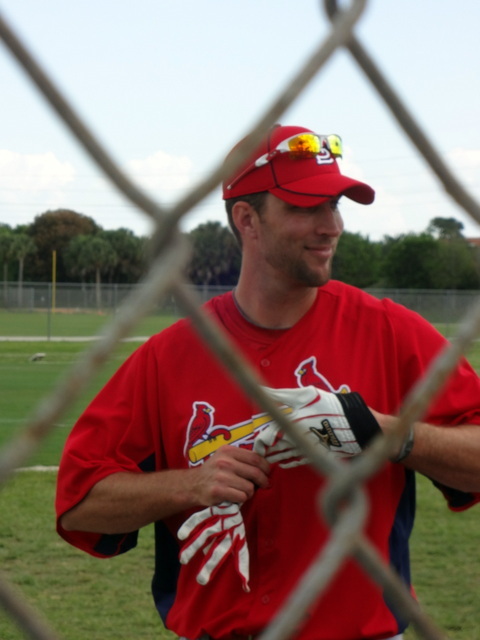 And our arsenal includes today’s starting pitcher Adam Wainwright. Adam didn’t have his best stuff today, and the Tigers got out to a 3-0 lead in the 3rd. We made it 3-2, and then an error by Rafael Furcal gave the Tigers another run. Tyler Greene hit a towering homer, and the Cards eventually broke things open after Tiger reliever Phil Coke debuted with 7 straight balls, something I don’t think I’ve seen since my grade school softball days. The Cards prevailed 9-5. After the game, I picked up my 2012 Spring Training schwag at the team store and went to check in at the Homewood Suites in Palm Beach Gardens. The hotel is just a mile from the stadium, so I’m looking forward to walking back over there in the morning to catch some of the action on the practice fields. For dinner, I checked out Little Moir’s Food Shack, a tiny strip mall eatery that gets raves on Yelp and was mentioned in some Spring Training write-ups. 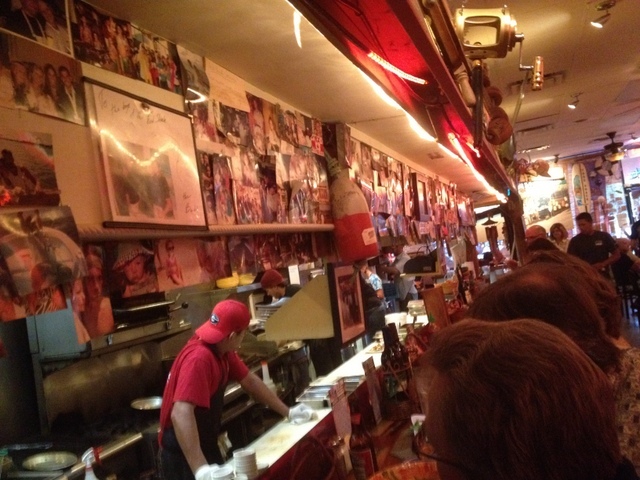 The place doesn’t take reservations and is crazy popular – I waited 30 minutes, and I was dining by myself at the bar. People who wanted tables had to wait more than an hour. The bar seats are great for those who are dining alone because you have a front row seat for the action in the kitchen. The place reminded me of a non-chain Margaritaville, with an adjoining bar with a live band and a caribbean-inspired menu. The menu changes daily. 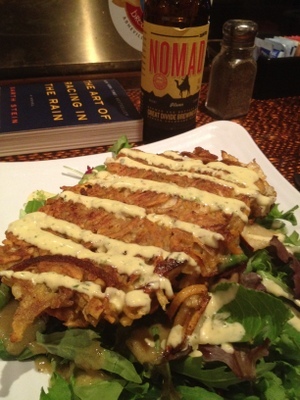 I had the sweet potato encrusted grouper, which was delicious. They had a bunch of local beers on draft. 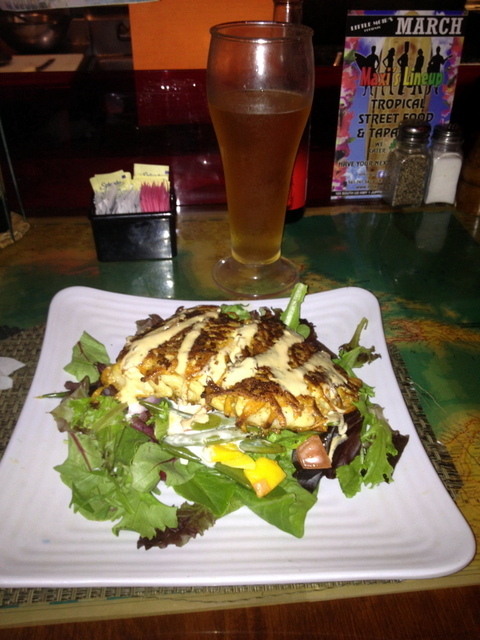 I tried the Tequesta Chancellor Ale which paired well with the fish. When in Florida, I can’t resist key lime pie. 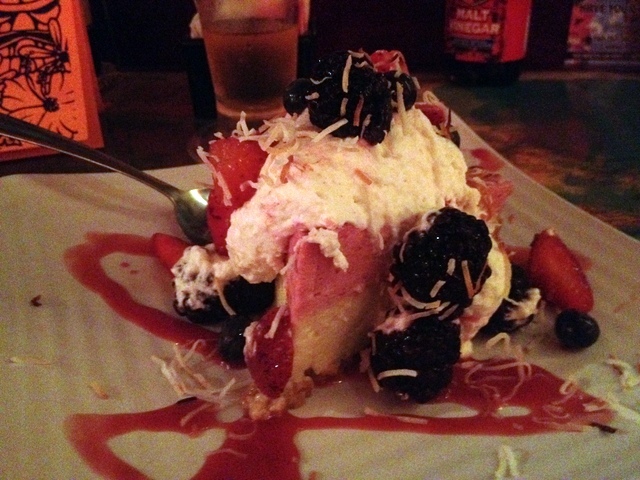 It’s different everywhere you get it, and the Food Shack had a raspberry key lime pie that was garnished with berries. Everything was delicious and totally worth the wait. I may just go back tomorrow! The restaurant is conveniently located near the Burt Reynolds and Friends Museum, which I visited a few years ago and highly recommend for pop culture vultures. Check out my full report on the museum and pics. Expect some better photos tomorrow from my real camera. I only had my iPhone with me today because I failed to charge my camera. I’m looking forward to seeing the Cards take on the Marlins – a preview of opening day.